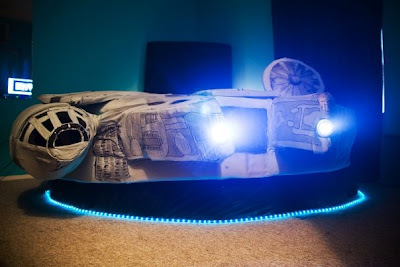 10 Cool and Creative Millennium Falcon Inspired Products. 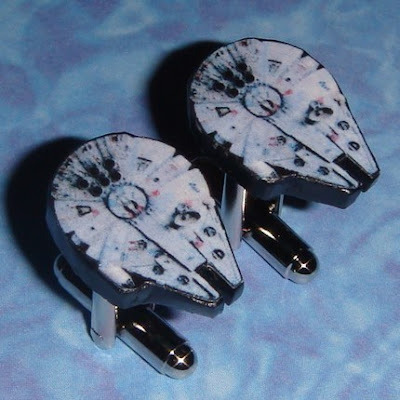 Collection of cool and creative Millennium Falcon inspired products from all over the world. 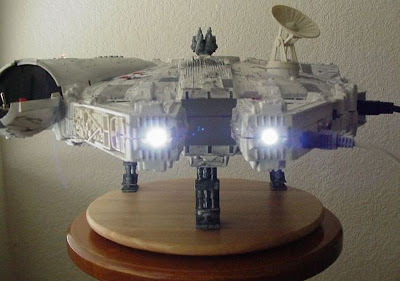 Millennium Falcon PC: Millennium Falcon computer mod has multi-colored cycling power light, dual hard drive activity headlights, blue EL-string engine bay, 6 exhaust fans for cooling, dual hard drives including one with window, power, reset, and engine light switches in cockpit. 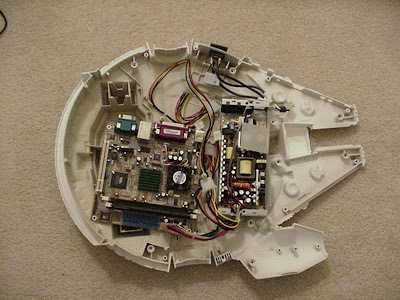 The mouse is based on another starwars toy and includes wireless RF-based X-Wing fighter mouse. 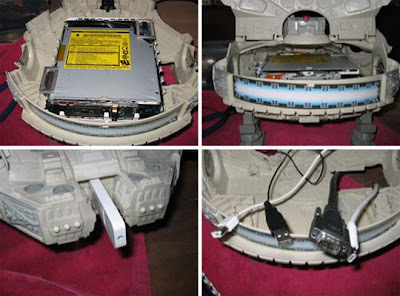 Apart from these it has a VIA mini-itx motherboard, two 2.5 inch hard drives with 256MB memory. 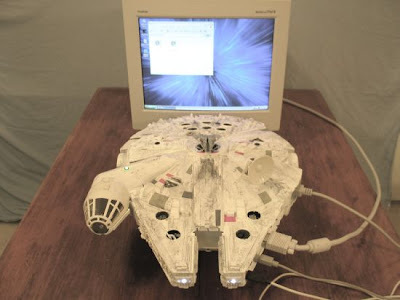 Plus we got USB, PS2, ethernet, VGA, and audio for external ports. 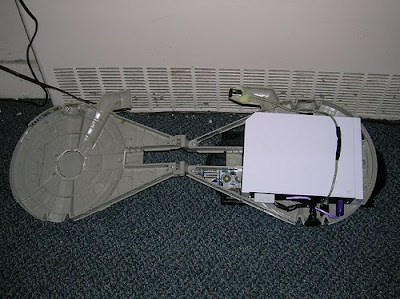 Wiillenium Falcon: Grayson integrated a Nintendo Wii within a toy model of the Millennium Falcon. 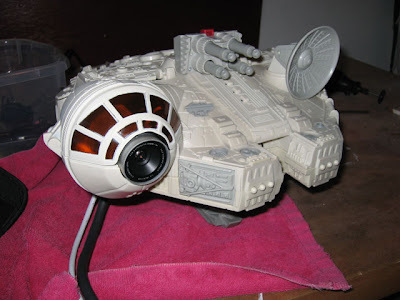 Millennium Falcon Mac mini: Derrick fitted the Apple Mac mini into the Millennium Falcon's interior. 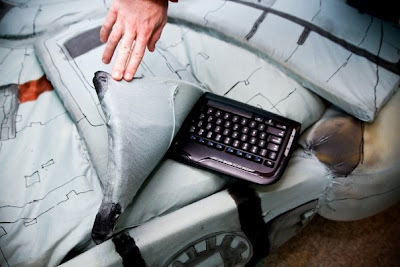 "With a bluetooth wireless keyboard and mouse as it's main input devices. Using either Remote Desktop or VNC, we are able to run updates. 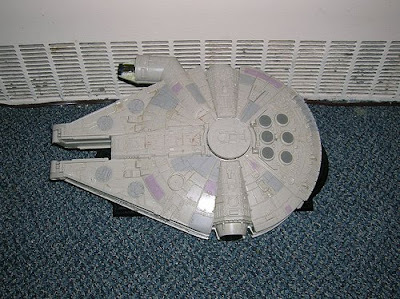 It is connected via the network using an Airport Extreme wireless card, so we can transfer files as needed." 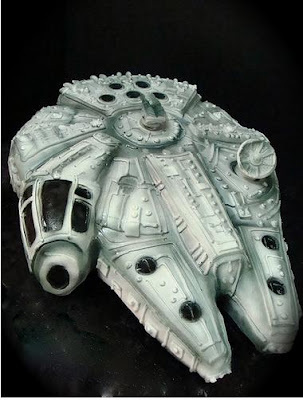 Millennium Falcon Remote Control: At first glance, it looks just like a plain Millennium Falcon replica. 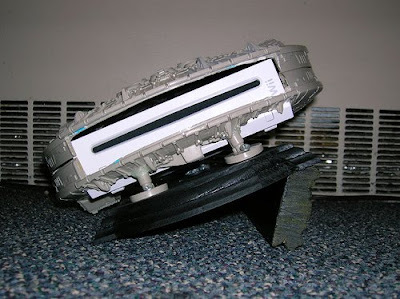 But wait until you press the button, the entire backside slides out into a full remote control. 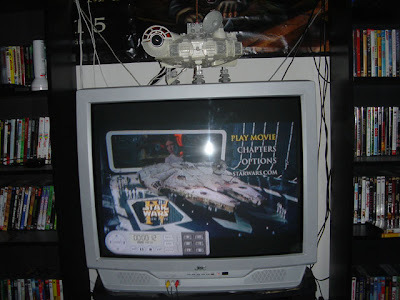 The remote can be used to control the R2-D2 projector, the DVD player, a CD player, and an iPod. 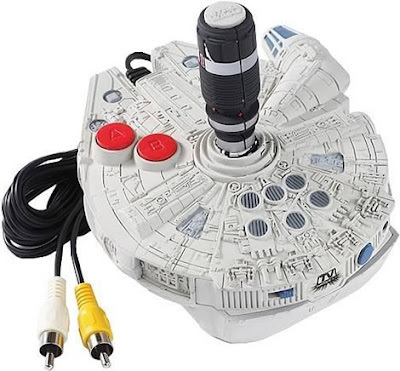 Millennium Falcon Joystick: The Millennium Falcon themed joystick controller comes with four classic starwars games built into the joystick; all you have to do is plug it in to a TV using the supplied RCA cable. 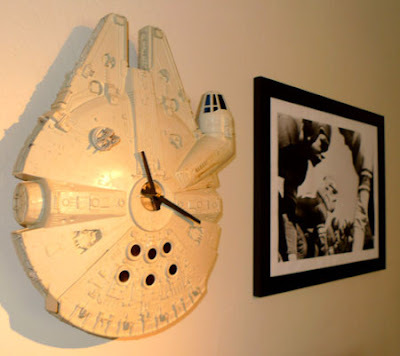 Millennium Falcon Clock: This is something that every starwar fan would like to have in the room; it's a homemade clock by Nerdsquared. 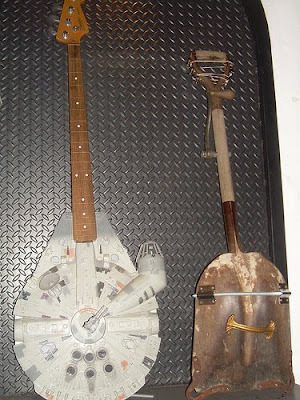 Millennium Falcon Guitar: There's no real information on this one. 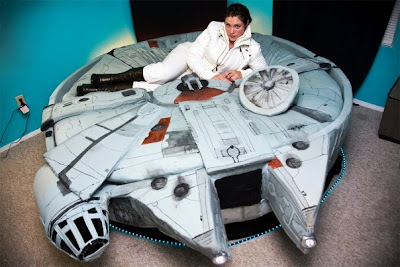 Millennium Falcon Bed: Creation of Kayla Kromer, the maker of the famous Hamburger Bed. 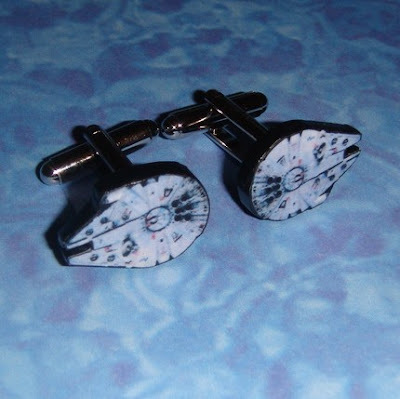 Millennium Falcon Cufflinks: Each one of these are handcrafted from polymer clay and would make an ideal addition to any starwars' fan wardrobe. 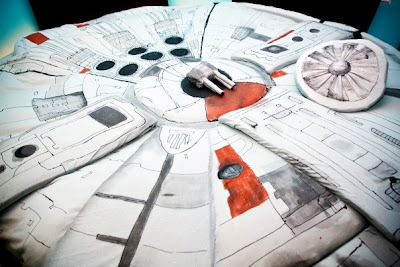 Millennium Falcon Cake: A real treat for all the starwar fans, an awesome creation of Debbiedoescakes. 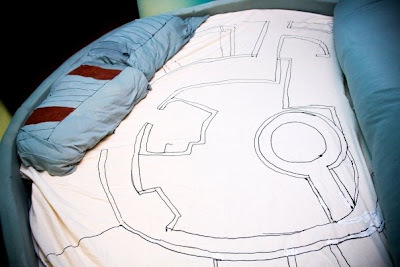 Illusions Worth A Second Thought. Girl Who Doesn't Close Her Mouth. All In A Days Work Of A Photographer. Interesting Pedestrian Bridge - Pulau Langkawi, Sky Bridge. Impressive Wood Sculptures by Gehard Demetz. Poem Using Light and Shadow. 20 Cool And Creative Drinking Straws. Coolest Ballpoint Pen Art - Part 3. Impressive Court of Kunsthof Dresden. Acrylic Paint on People By Alexa Meade. 30 Creative Bathroom Gadgets For You. Etched Leather Artwork By Mark Evans. 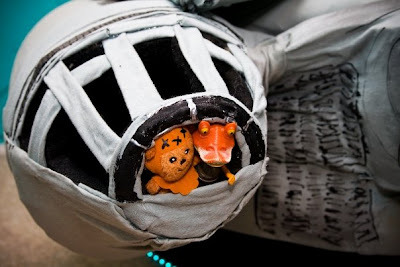 25 Creative And Awesome Toilet Paper Designs. 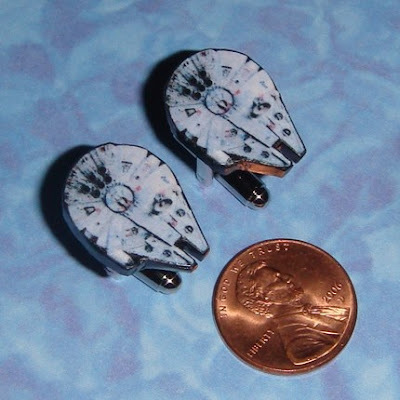 25 Cool And Creative Coin Banks.